Because you can't make up islands with a magic line. 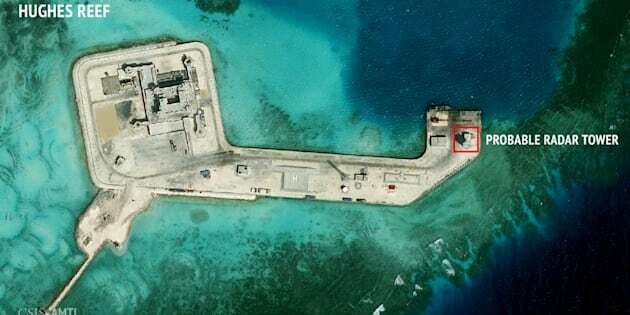 A satellite image released by the Asian Maritime Transparency Initiative at Washington's Center for Strategic and International Studies shows construction of possible radar tower facilities in the Spratly Islands in the disputed South China Sea. Prime Minister Malcolm Turnbull has urged claimants to the South China Sea to respect the landmark Hague ruling that China has no legal basis to claim historic rights over the region. The International Court in The Hague ruled overnight that China has no legal claim to historic rights in the South China Sea, where it has been building artificial islands in the resource-rich region which acts as a main artery for about $4.5 trillion worth of shipping trade a year. China, whose claim is based on a vaguely drawn map that overlaps claims with five other countries, rejected The Hague's ruling. "Every nation in our region has benefitted enormously from the many, many decades of relative peace and tranquillity in this region and it is vital that that is maintained," Turnbull told reporters in Canberra. "There is so much at risk in the event of conflict in the event of heightened tensions, so this is an important decision, it is one that has been made in accordance with international law and it should be respected by both parties and indeed by all parties and all claimants." Australian Foreign Minister Julie Bishop said she would be discussing the matter at the East Asia Summit and the ASEAN regional forum in late July. "In the meantime, we urge all parties to deescalate tension, not take any action that would provoke or increase tensions," she said. She earlier said ignoring the ruling would be a "serious international trangression" bringing "strong reputational costs".
.@JulieBishopMP Stephen Conroy is urging an escalation of tension. 'Highly irresponsible'. Australia will continue to to exercise its right to Freedom of navigation in the region, she told the ABC. "Australia will continue to exercise our international law rights to Freedom of Navigation and overflight, and support the right of others to do so," Bishop said. Labor defence spokesman Stephen Conroy accused China of bullying other nations, and told Radio National that during Senate estimates he had questioned defence officials, who had made it clear they were not authorised to engage in Freedom of Navigation exercises. "The Government is continuing to pretend to the Australian people that it has an ongoing program of what is referred to as Freedom of Navigation operations in and around the South China Sea," he said. "Australia should authorise its forces to both sail and fly over the areas of the South China Sea." Chinese president, Xi Jinping, has said China's territorial sovereignty and marine rights in the seas would not be affected by the ruling. China's Ambassador to the United States, Cui Tiankai, accused the tribunal of "professional incompetence" and "questionable integrity", CNN reported. The Hague ruling also found the Philippines' maritime rights were violated by the building up of artificial islands that destroyed coral reefs and disrupted fishing and oil exploration. The U.S. State Department called on both parties to comply with their obligations, according to a statement sent to AP from spokesman John Kirby. Retired diplomat Richard Woolcott told ABC News 24 there was no need for Australia to take sides in the issue. "Australia accepts the rulings of the court and so that's fine but we're not involved in this case. And even the United States itself, until relatively recently, did not take sides on these sort of cases. When the United States then encouraged The Philippines and Malaysia and Vietnam to make an issue of this, China's naturally reacted to that," Woolcott said. "I think if I was a Foreign Minister, which I'm not, I would certainly simply say well the decision has been taken, it's unlikely China will accept it, or they won't accept it and what we really need to do is have sensible discussions about how to resolve this. He said countries contesting China's claim need to recognise the country's importance to others in the region. "The Philippines Foreign Minister said this is the right way to go, after having the demonstrations, applauding the decision, they have said now we really need to talk," he said. "I mean China is too important to all these countries and we need to recognise that. I mean it's not the United States that is still the strongest country in the world but it's gradually giving way to a rising China and India too for that matter. ANU Professor of International Law Donald Rothwell warned the ruling could potentially bring Australia into conflict with China. But he said it was difficult to anticipate what course China would take in the longer term. "There are of course multiple scenarios. The worst case one would be a Chinese reaction that sees the declaration of an air defence identification zone," he told ABC News Breakfast. "It would mean that all Australian aircraft passing through the region would need to identify themselves and that would raise significant issues for Qantas, for example, as to how they would respond to that action." But University of Sydney conflict expert, Adjunct Associate Professor Jonathan Bogais, said despite the court win, the Philippines' newly elected President Rodrigo Duterte did not share his predecessor's enthusiasm for confronting China on the issue. Duterte has already indicated he wants a "soft landing" on the issue. From China's perspective, securing a compromise with the Philippines, a U.S. ally, could help it destabilise the US Asia-Pacific strategy. "Duterte was not elected on foreign policy, he was was elected on domestic policy," Bogais told The Huffington Post Australia. "Therefore, he will see the need to start a bilateral process of negotiation with China as a great opportunity. "There will be a tremendous amount of rhetoric, now doubt, in the days and weeks to come from both sides, but the bottom line will be the need to negotiate and and he will be able to convince his electorate in the Philippines that this is more important than a confrontation no one can win." Philippines Foreign Minister Perfecto Yasay last month rejected suggestions a strong statement against China be issued if the decision goes Manila's way. "We call on those concerned to exercise restraint," he said on Wednesday, following the Hague decision. "The Philippines strongly affirms its respect for this milestone decision as an important contribution to ongoing efforts in addressing disputes in the South China Sea." "In terms of China's domestic politics [the ruling] is unacceptable to the regime and unfortunately the regime will perceive that the Chinese people view that as unacceptable," Townshend told The Guardian.